That's it above, the Dixon Ticonderoga #2. Yes, the "premium cedar barrel sharpens easily." I never thought I'd use pencils much after elementary school. And I didn't until I started blogging. I keep my list of posts on a small Rhodia notepad (model #13) and I do so in pencil because the time and day of my posts change constantly, what with new things coming in that preempt stuff previously scheduled. I gave up trying to do it with a pen and went to pencil eons ago so that I could make sense of my frequently revised posting schedule. I'd never given much thought to which brand of pencil I write with until the current box of Dixons came to the top of the to–use pile. What sets this particular pencil apart from its cedar brethren is not the pencil's writing capability or appearance, though both are fine; rather, it's the wonderful eraser. Unlike most pencils' erasers, which are kind of stiff and unyielding and produce an unpleasant sensation up the pencil shaft to the fingertips, the Dixon eraser is made of a much softer, more yielding rubber which seems almost creamy in its transmitted paperfeel. Try one — they're $1.99 a dozen at Staples — and see if you don't agree that they really are a superb cheap thrill. I've said it before and I'll say it here again: there is nothing too great or too small to attract my focus and attention. Let me take it one step further: there's no difference between great and small whatsover, but what we choose to make of things. » Riley News Mid-August at Earliest from media relations. While I can't claim to have tried the Dixon Ticonderoga #2, my favorite pencil of all time is the Mirado Black Warrior #2. It writes very smoothly, and has an excellent eraser. FWIW, they're made in Mexico now. Now that I have decided to devote all my spare time to doing Sudoku puzzles I have become fond of BIC #2 0.7 mm mechanical pencils. A lot of solving these puzzles involves erasing all the possible but discarded entries in any given box. And for when you wind up with two nines (or whatever) in one column, nothing serves like a large gum eraser for erasing the whole damned puzzle and starting over. i love pencils. i do crosswords, and even though i'm pretty competent, i still like to erase now and again. but i must say that the #1 is far superior to the #2. the soft, dark line, the silky writing. and for non attached erasers, i much prefer the Staedtler Mars plastic white eraser "Gomme pour papier et film." can't go wrong with a Geman engineered eraser, i say. It's good to see praise written about something as low-tech as the pencil. The change from hard pink rubber eraser that tears up the paper you're trying to erase, to soft, kind to the writing surface eraser, truly rocked my world. (Doesn't take much.) Your brand is wonderful, but if you demand excitement in a pencil you might go to an arts-crafts store (Michael's, Hobby Lobby, etc.) and pick up a few of the wildly decorated (frequently with seasonal designs) kind they have available in the writing utensil department. They're usually unmarked as to lead softness but they're all equivalent to No. 2. The big plus is that the soft vinyl erasers stuck on the ends have designs in them, too. Stars, flowers, checkerboards, etc. The good old yellow pencil is admittedly a classic, but if you should want something girly for the occasional wild mood, there you go. For everyday writing use, most people don't like to use an eraser that is unconnected to the pencil, but if you want a truly silky erasure, try the Magic Rub by Eberhard-Faber. Any old vinyl eraser is so much better than the old pink rubber version for erasing on paper. A truly silly joke my flute teacher told me when I was 15 yrs. old and he wasted half of my expensive lesson time telling it: Long setup which I won't go into but a guy has situated himself outside some dead composers's mausoleum, swears he hears noise coming from inside. He goes to the place night after night and hears (here you make the sound of an eraser rubbing on paper, then a hand sweeping the eraser dust away; you repeat this ad nauseum). Noise finally gets investigated, a crack is made in the tomb, someone calls in, "Hey, what's going on in there?" Famous dead composer calls back, "Go away, I'm decomposing." 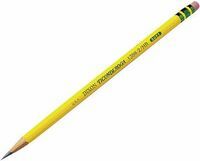 Henry Petroski -- engineer who writes -- wrote an entire study of this humble implements: Pencil. You would enjoy anything he writes. Behind the design, lurks an engineer or two.